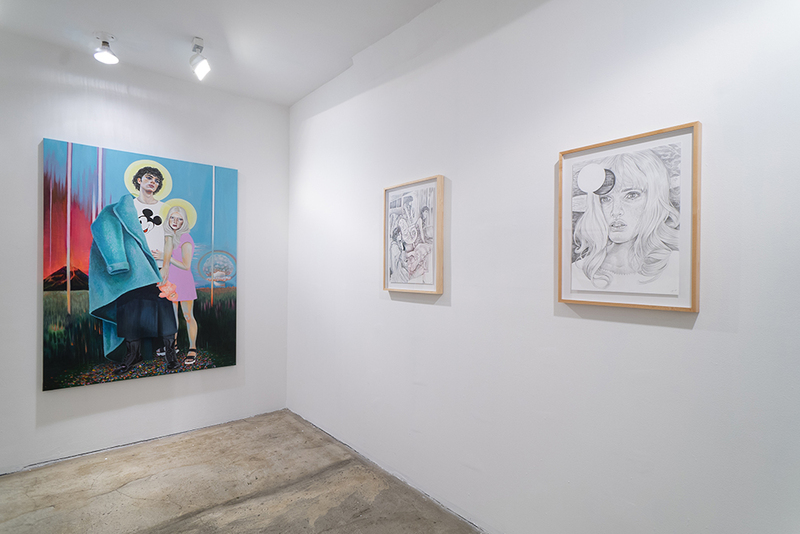 Massey Klein is pleased to present Life is but a dream, a solo exhibition of new works by Martine Johanna. 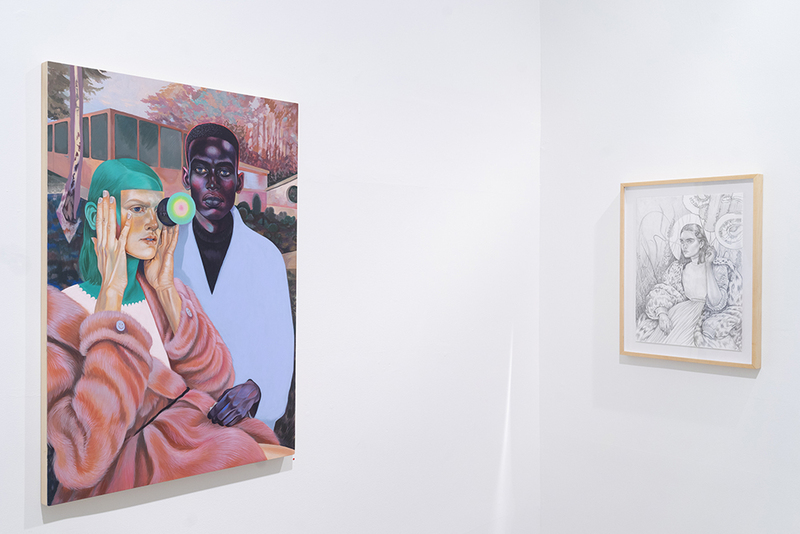 In Martine Johanna’s exhibition, Life is but a dream, six vivid paintings hang alongside six meticulous drawings of the same subject and composition. 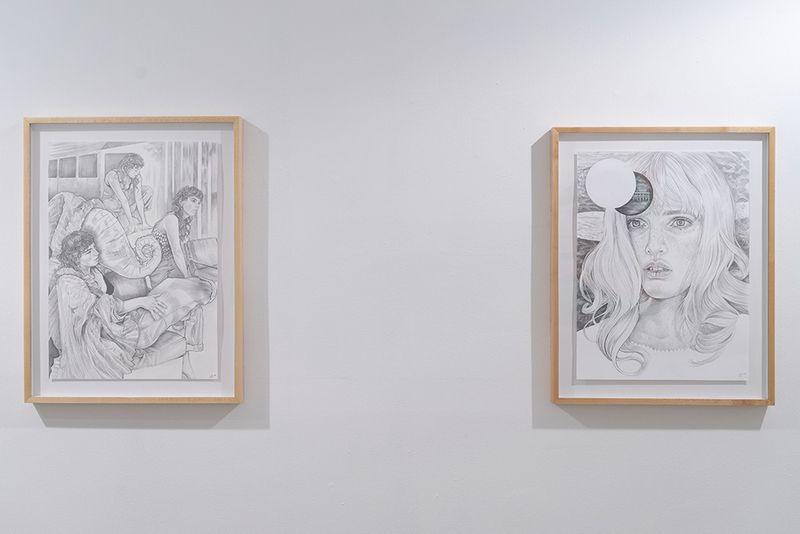 Never before has the artist created her works in pairings: first as an intimate graphite exploration, then followed by an acrylic on canvas painting, substantially larger than the drawing. 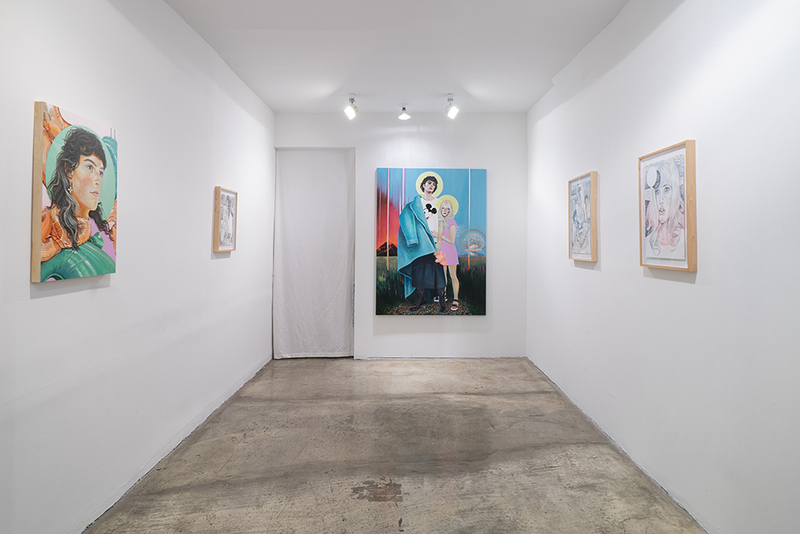 Indicative of her practice, her autobiographical works, seemingly lighthearted, explore the duality between youthful naivety and anxiety-riddled adulthood. The figures, fierce but fragile, crowd the compositions and occupy the majority of the space gazing distractedly into the beyond. Each of Johanna’s delicately rendered figures convey a sense of immersion within their own “internal psychic landscape”. 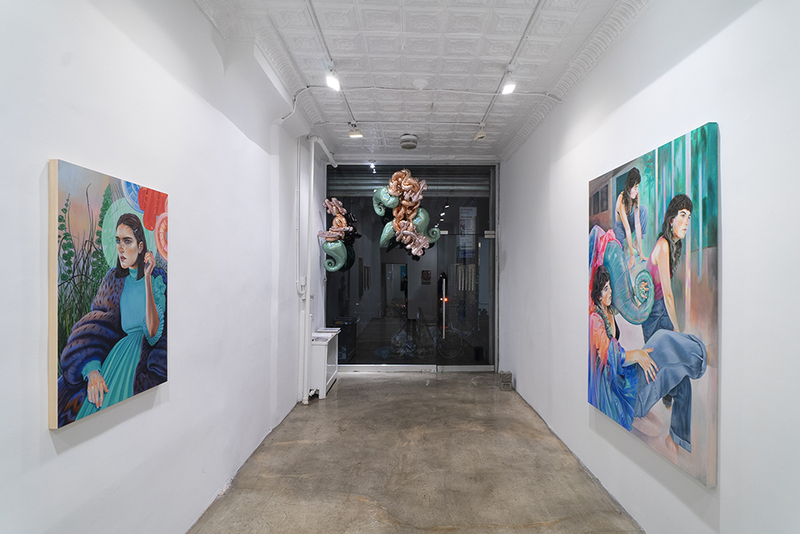 The work is imbued with a mysterious narrative that is celebratory (one can find confetti, helium balloons, and streamers strewn throughout the body of work) but ominous. The characters stand in the foreground, amidst the disasters, both natural and man-made, occurring in the background. Also incorporated in her paintings is the use of architectural elements. Johanna disrupts pastoral settings with inclusions of International Style buildings, adding a complex layer to the dense and intricate fantasy worlds. In past works, the artist has favored airy and ambiguous environments, her characters floating, gazing, and huddling in emptiness. The most recent works featured in Life is but a dream, recall the presence of her early drawings where rich textures and plant life engulf the figure. Building upon this aesthetic, Johanna presents us with a rich progression of the world in which her characters exist. Martine Johanna is an artist known for her vivid paintings with both figurative and abstract elements. The paintings have a signature prismatic palette, visually stimulating and playful while expressing an underlying sense of uncertainty and unrest. The artist has had international success exhibiting extensively in the Netherlands and abroad. Inspiration for her work include a mixture of childhood and autobiographical memories and experiences, documentaries on human nature, independent films and history. Please join us on Friday, October 12th from 6-8pm for the opening reception. The artist will be in attendance. For press inquires or information about works available, please email info@masseyklein.com.